Each Monday brings an opportunity to join in Cathy’s weekly challenge called In A Vase On Monday. The goal is to fill a vase using materials collected from the garden. Early this morning I was out gathering foliage and flowers for today’s vase, but it has been a busy day. Finally I have a just few minutes to share what I collected before running off to a meeting tonight. 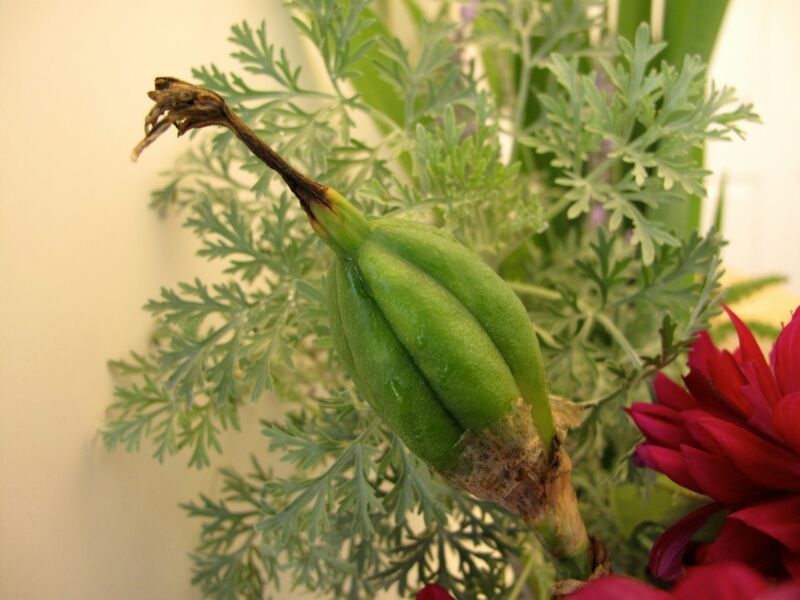 The other day I had spotted a large seed pod from one of the still blooming Irises that I thought might be attractive in a vase so I started with it. Many foliage plants looked fresh and interesting today. Also there were lots of Dahlias this week (I definitely plan to plant more Dahlias next year) and I found one of the newly planted red snapdragons blooming. I put together stems of roughly the same height and stored them in some glassware (even one of last night’s wine glasses) to allow them to condition until I could find time to make an arrangement. Everything seemed so fresh I would have been satisfied to enjoy these flowers all week without further tweaking. Eventually I did get around to making a design. I selected for today’s container a lovely blue and green glazed ceramic pot created by my daughter during a high school art class. Here are some views of the final arrangement. These two are looking down from the top. I liked the Iris seedpod, and also the contrasting Rudbeckia seed heads. I used Iris , lupine and lamb’s ear foliage to add texture. A few sprigs of Meadow Sage ‘May Night’ add a nice color change from the red dahlias and snapdragons. Thanks to Cathy at Rambling In The Garden for hosting. Discover what delightful things she and others are placing In A Vase On Monday. Perhaps you will be inspired to share your own vase. 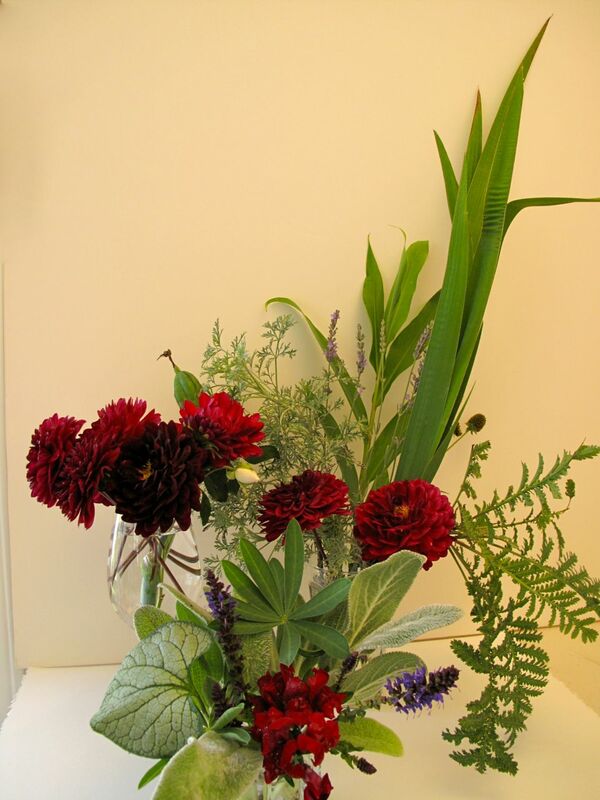 This entry was posted in garden and tagged Dahlia 'Blue Bell', Floral Design, flower arranging, in a vase on monday on October 20, 2014 by pbmgarden. I love the dahlia and have one just like it that I love too…and the color combo is great…especially wonderful use of foliage…most of my foliage is pretty ratty now. And what a great vase specially made! The dahlia has been prolific, thus it shows up in successive weekly vases, but I really am pleased with it. I am surprised at the quality of some foliages in the garden. It has been nice and cool here but not too cold yet as to damage it. My daughter is now an architect and has always created interesting objects that I’m only too happy to display. Very nice, Susie. I like your use of the Lamb’s ear foliage. 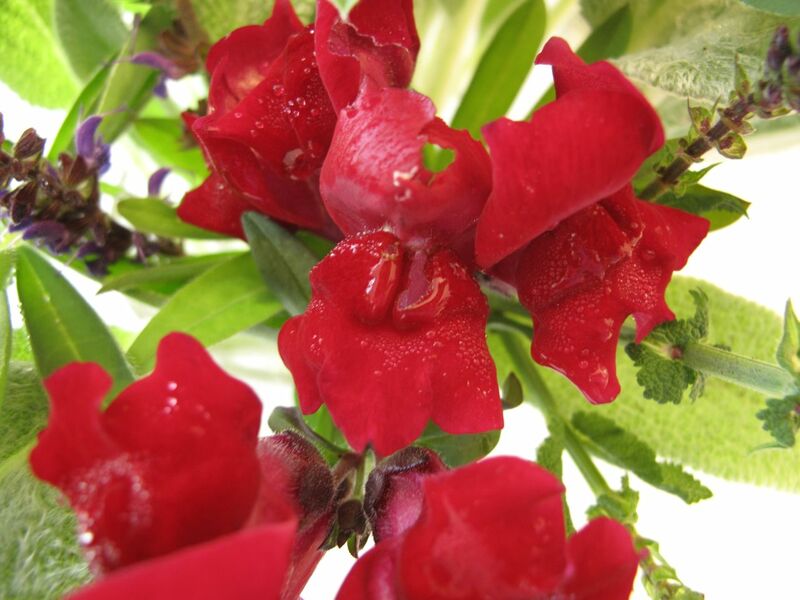 I stopped using it in my garden because it got a bit ratty…and spread into unwanted areas. Why do some of the very desirable plants do that to us? Thank you John. I know what you mean about Lamb’s ear. In a new garden I might just omit it also, but I ruthlessly yank it out now in some places and cut back the flowers to try to keep it under control. It has a great texture. At Williamsburg I learned it used to be used as bandages in colonial times. The image of the flowers conditioning is very satisfying, I’d be happy with that as my arrangement. Your Lamb’s Ears foliage looks perfect, strangely it doesn’t grow well for me (you’d think I had the perfect conditions for it, wouldn’t you?). 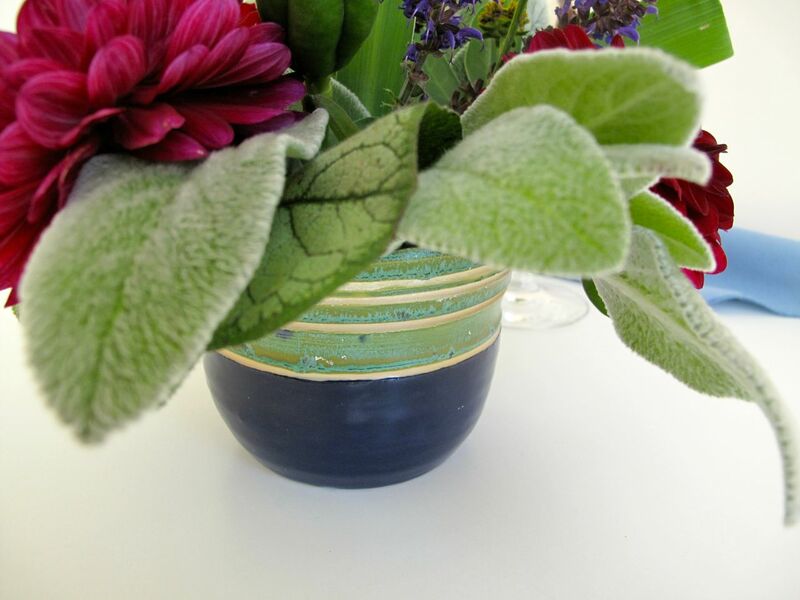 I love how you use so much lovely foliage in your vases. The Dahlia is a beauty. I have begun to try to decide which ones to grow next year. I am surprised lamb’s ears doesn’t grow well for you. It can look pretty poor here when we get a lot of rain, but I like the foliage when it is fresh. The Dahlia has been so enjoyable–I’m hoping it will overwinter, although reputedly it should be dug up. This is a lovely arrangement Susie and your daughter is very talented, I really love the vase you have used today. Thanks Julie. My daughter made some nice ceramic pieces and I’m glad to have a chance to use them occasionally. I haven’t often used stachys foliage but it seems to hold up pretty well. I agree it is nice to exchange ideas through these Monday vases. I especially love your choice of foliage this week Susie. 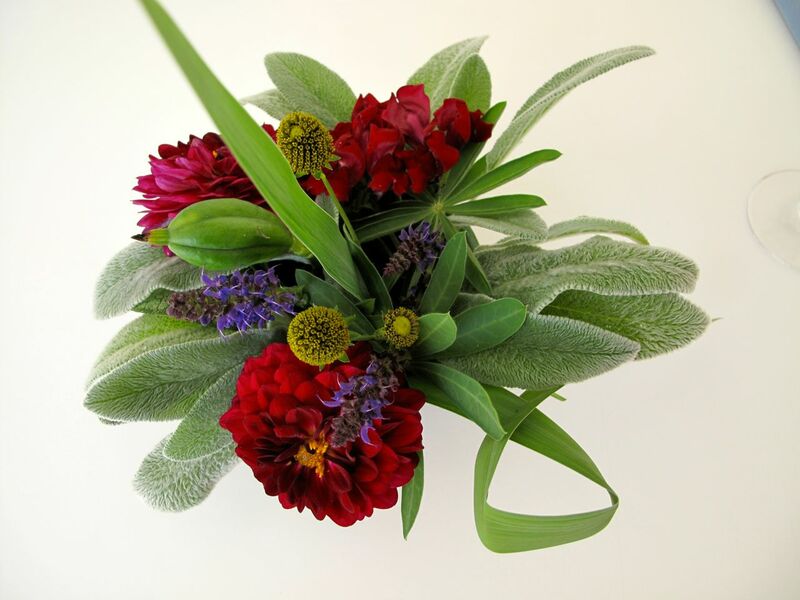 The lamb’s ear and lupine are very pretty and the photos from above are lovely! Dahlias are so underrated. Yours is a beautiful deep colour. Thanks Cathy, I was taken by the foliage in the garden this week. It seemed so fresh, well some of it anyway! Glad you like the photos from above–I’ve been experimenting with my camera. That dark Dahlia is wonderful, Susie, and you did a great job complementing it with the vase and other materials you selected. The twisted Iris leaf is a particularly nice touch! 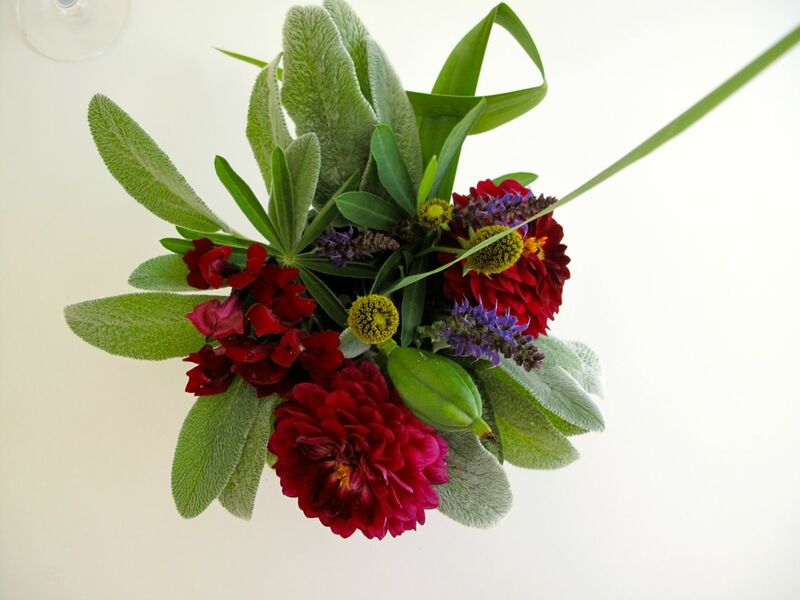 Your could give classes in the art of flower arrangement. Thanks Kris. The Dahlia is so dark it makes it hard to photograph, but I really love its rich color. (I am taking a floral design class this year, so hope to pick up a few tricks). Lovely rich colours and a great choice of foliage to finish it off. Another winner. Thank you so much. I hope the nice weather holds on a bit longer, so there will continue to be some fresh flowers and foliage to use. Stunning combination of colors and I love the bright red and the soft green. Thanks Judy. The soft, gray-greens always appeal to me. 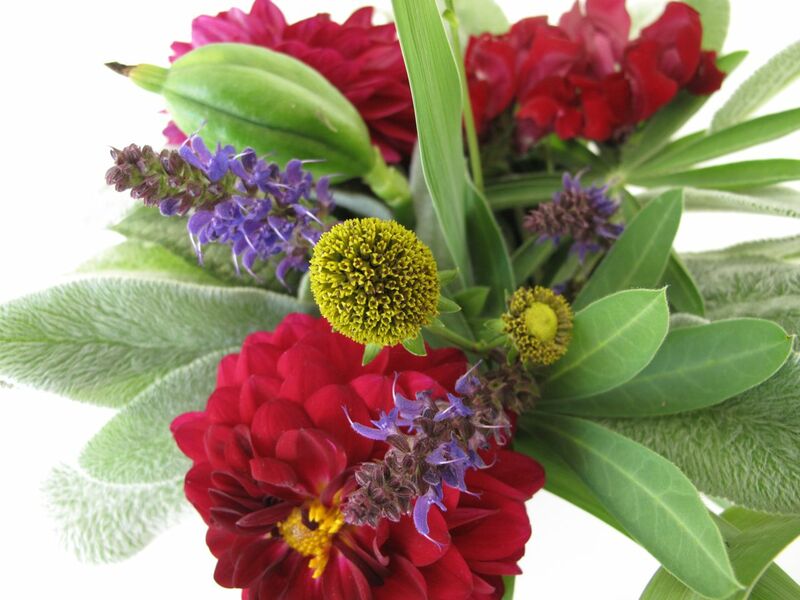 Gorgeous – I love the dahlias and snapdragons combined with the Stachys. Thanks Jason. I wish I could keep those rich, red colors in my garden throughout the year. The gray-green or silvery foliage colors are always my favorites. So pretty and well balanced, Susie. 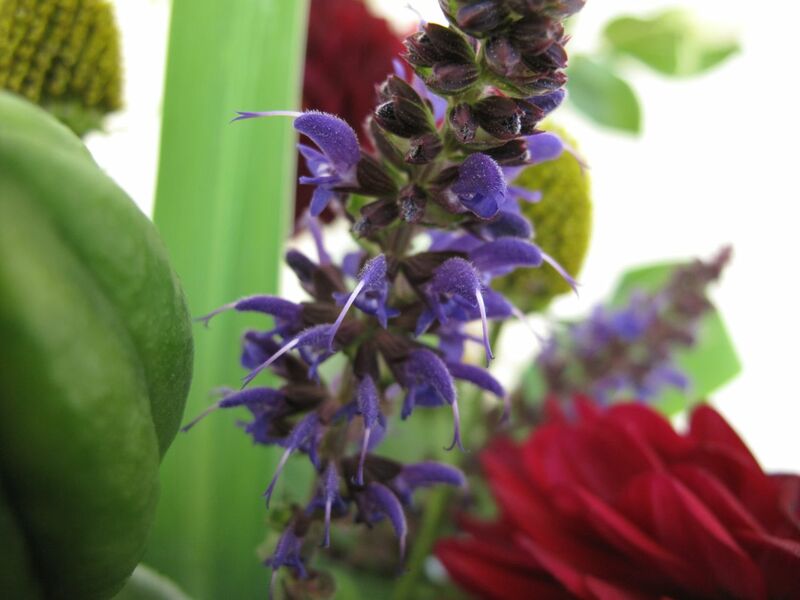 What a great idea to include Stachys – they complement the dark red flowers so well. Love the Rudbeckia as well. Thank you Annette. 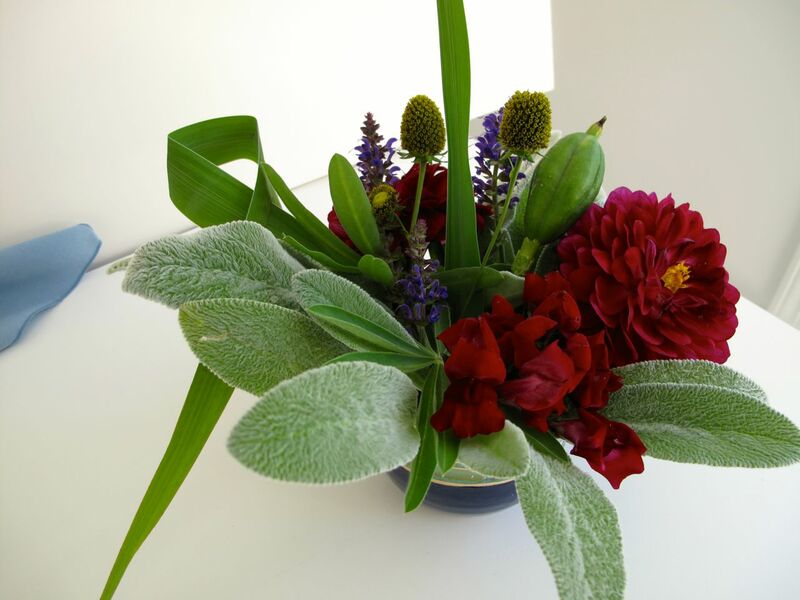 The dark red contrasted so greatly against the silvery Stachys the arrangement was hard to photograph–almost black and white.